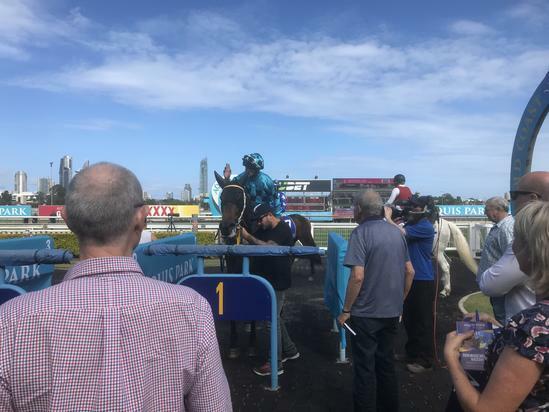 Absolutlypositivly made a successful return to racing today at Aquis Park at the Gold Coast when taking out the National Masonry Fillies and Mares Class Two Handicap. The daughter of Sepoy was having her first start since running in the strong two year old race over the famed Grafton carnival and settled mid field before unleashing a powerful finish down the middle of the track and put in a winning stride to win in a photo finish with a further two lengths to the third horse in impressive time of 109.25. Winning Co Trainer Bryan Guy was thrilled with the return of the filly given she has always shown above average ability and only needed time to mature both physically and mentally “I have loved this filly from the first time I came across her at the Magic Millions National Yearling Sale and was thrilled to be able to secure her for Aquis Farm. She has been a filly that has shown above average ability from day one but wanted to go hard within herself so this time in we decided to put ear muffs on her and along with a patient work program we look like we have settled her down”. Winning jockey Chris Whiteley looked to have his work cut out when the barriers were released but had no problems securing a midfield one off the fence run before making a race winning move approaching the corner and then getting the bob in on the line to claim the prize “That was a good win, I was a little worried about the barrier but things went our way. I was very confident going into today’s race as I galloped her on Tuesday morning and told Bryan and Daniel that was a race winning gallop so thankfully I still know what I am talking about, seriously though she is a filly with a future”. Absolutlypositivly is owned by breeding powerhouse Aquis Farm along with local Gold Coast identities Bruce Mathieson, Bryan Barnes and Terry Jackman who purchased their share at a local surf club auction and Co Trainer Daniel Guy explained after the event how much enjoyment this filly has brought the ownership group “it’s great when this filly wins because she has a big supporters group at the Mermaid Beach Surf Club so hopefully it can continue and we think it will given the way she won and time that she ran today. It’s also nice to win another race for Aquis Farm who have a few nice three year olds in the stable so they could be in for a big summer”.